The Acorn TV September 2017 premieres calendar focuses on police, lawyers and correctional officers—and now Doc Martin! The new season premieres Sept. 21. Acorn added a late-breaking exclusive U.S. premiere to its September calendar: Season 8 of the popular hit “Doc Martin.” New episodes will premiere on Acorn TV just days after the British premieres. Learn more about the show below. One of Canada’s best TV imports, the police drama “19-2,” ends its four-season run this month with our heroes in peril as they fight gangs and killers. Acorn also has two dramas from “Prime Suspect” creator Lynda LaPlante: “The Governor” follows the first woman warden at a maximum security prison, while “The Commander” tells the story of another complex woman who is a high-ranking police officer. On the lighter side, the new Aussie legal series “Newton’s Law” premieres exclusively in the U.S. Click the link in the show’s title to read my mini-review. Read more about the Acorn TV September 2017 premieres below. 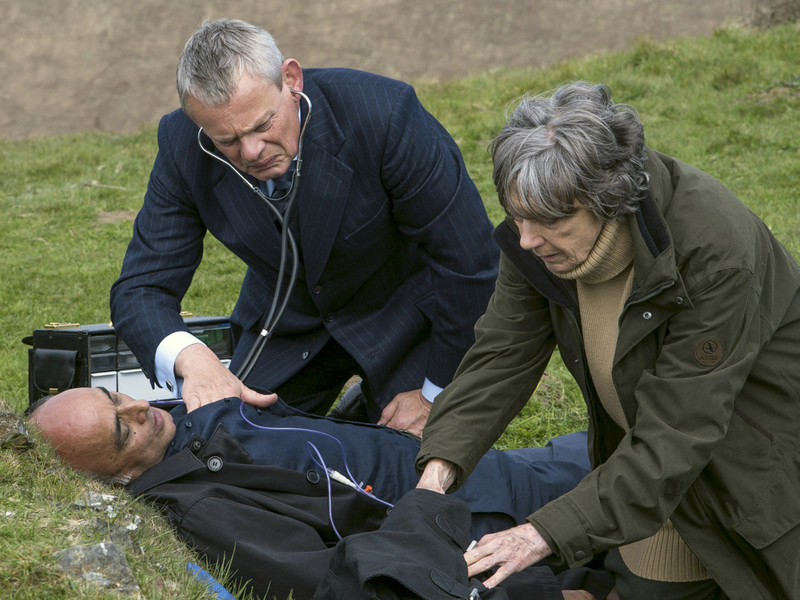 This behind-the-scenes special about “Doc Martin” debuts before the October premiere of Series 8 on Acorn TV. Broadcast in the U.S. on PBS as “Manor House,” this Channel 4 reality series follows as a group of people fill the traditional roles of an Edwardian Country House in Scotland. One family took on the mantle of privilege while 12 individuals bore the yoke of service. For three months, they volunteered to immerse themselves in a world of social inequality and rigid class distinctions as they move through time from 1905-1914. The final two episodes in the first season of the must-see medical drama set in India. “Prime Suspect” creator Lynda LaPlante delivers another complex female police officer. Amanda Burton stars as the ambitious and exacting Commander Clare Blake, the head of the elite Murder Review Team and the highest-ranking woman officer in New Scotland Yard. Guest stars include Hugh Bonneville (“Downton Abbey”), James D’Arcy (“Broadchurch”), Celia Imrie (“Bridget’s Jones’s Diary”) and Simon Williams (“Upstairs, Downstairs”). The popular British series stars Martin Clunes as the tactless, self-centered and uptight doctor of the title, who has his practice in Portwenn, a quirky seaside town in Cornwall. After having therapy to save their marriage in the last season, Doc Martin and Louisa (Caroline Catz) face the challenge of living happily together with their baby, James Henry. The new eight-episode season premieres every Thursday through Nov. 9, when the complete season will be available for binge-watching. All seven previous seasons already are available. The final season of this Canadian Screen Award-winning and International Emmy-nominated police drama premieres exclusively in the U.S. on Acorn TV. Canadian Screen Award-winning actors Adrian Holmes and Jared Keeso star as Nick Barron and Ben Chartier, respectively. Partners in the Montreal Police Department, the pair work to avenge the death of Nick’s sister in Season 4. They find themselves pulled into an escalating gang war that will see the whole squad pushed to their limits, forced to depend on each other more than ever before. Not everyone will make it out of this season of personal growth and terrible tragedy. This 2010-’12 BBC2 sitcom stars Simon Amstell as a television presenter searching for something more meaningful to do with his life. When is the new season of George Gently being shown on Acorn? I am told November or December by the Acorn TV people. Thanks for reading!